I feel immersed in a strange but beautiful week. Persistence. Seeking. All good things like that. Sunday I hung out with my friend Tabitha for the first time in a month. It was great to see her, and her beautiful son. 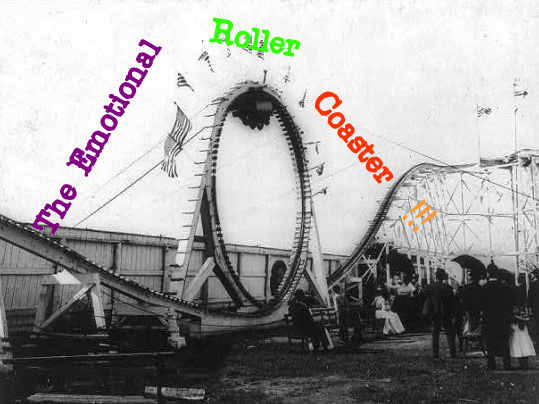 I've been on an emotional roller coaster. I'm so sensitive. I've figured out why, and it's nothing I can't handle, but it can be draining (and invigorating... then draining again). Today will be a day of manual labor. Well, not a whole day. It's just too hot to do anything in the midst of the afternoon. But we're renting a moving van, then using it to clear out some room. Then Thursday Mom and Dad are heading down with it to load it up with my sister's stuff. She's still in her apartment until the end of the month, but all but the bare essentials are coming up. I'll be here by myself. I'm really hoping to get to church tonight. I've not been to my own church in so long I'm too ashamed to tell you. It's not because I don't love and miss it: I just don't have a way. But I'm hoping to get to go tonight. I also emailed my church about maybe setting up a regular ride. I'm praying and hoping. Anyway. Life is going on, and I need to get off the computer and go catch up with it! See ya!